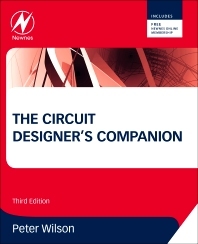 The Circuit Designers Companion, Third Edition, provides the essential information that every circuit designer needs to produce a working circuit, as well as information on how to make a design that is robust, tolerant to noise and temperature, and able to operate in the system for which it is intended. It looks at best practices, design guidelines, and engineering knowledge gained from years of experience, and includes practical, real-world considerations for components and printed circuit boards (PCBs) as well as their manufacturability, reliability, and cost. Organized into nine chapters, the book begins with a discussion of grounding and wiring of electronic or electrical circuits, when to consider grounding, and the main factors that must be taken into account when designing a new PCB. It then introduces the reader to passive components such as resistors and capacitors, potentiometers and inductors, and crystals and resonators, as well as active components like diodes, thyristors and triacs, bipolar transistors, junction field-effect transistors, metal-oxide-semiconductor field-effect transistors (MOSFETs), and insulated gate bipolar transistors (IGBTs). It also describes high-speed digital circuit design and analog integrated circuits, including operational amplifiers and comparators, and power supplies such as batteries. The final two chapters focus on electromagnetic compatibility and the latest advances in electronics, along with safety considerations in the design of electronic equipment. This book is an invaluable resource for circuit designers and practicing electronics engineers, electronic engineering students, and professors. "Wilson (electrical and electronic engineering, U. of Southampton) revises a textbook and handbook written by Tim Williams and previously published in 1990 and 2004. Some of the technological details have changed in the two decades, he says, but most of the underlying principles remain the same. There is material here for anyone from bright-eyed students to grizzled veterans, though not always the same information. Among the topics are printed circuits, active components, analogy integrated circuits, electromagnetic compatibility, and general product design." --Reference and Research Book News, Inc.